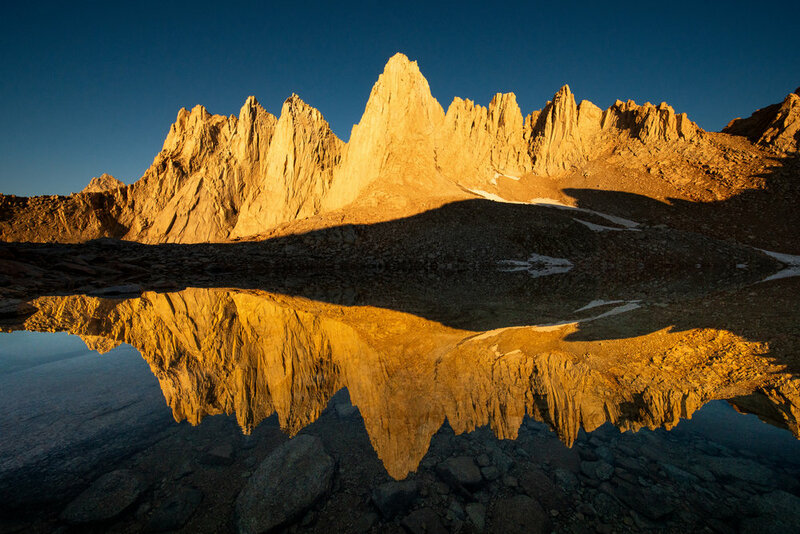 *DISCLAIMER* Any trail leading to the summit of Mount Whitney has it's own challenges and can be extremely dangerous to the unprepared adventurer. People die on these trails. Please do your research and make sure you have the appropriate gear and knowledge of the area before embarking on your own adventure. Helmets are a must. Ropes are not quite as important but pretty close. 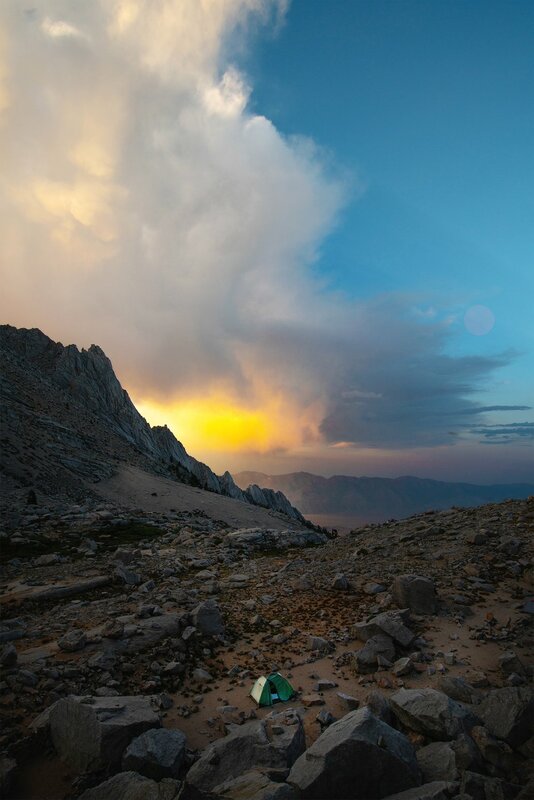 Summiting Mount Whitney via the Mount Whitney Trail is an achievement in it's own right. 22 miles of switchbacks, exposure and, worst of all, people. The hike is a popular one and attracts crowds from all around the world, so you're never really alone with the wilderness. Early on, I read about the trail and two main things stuck out to me. Number one, there were not a lot of photo opportunities of Mount Whitney on the way up. Plenty of beautiful scenery, but since you approach from the side, it's hard to get a good shot of the mountain. The second thing that stuck out was a quote by John Muir. He had stated the trail was for "soft, succulent people". That's when I found the Mountaineers Route. Emily and I wanted to play it safe when it came to altitude sickness, so we arrived a few days before our trek to acclimate. Wednesday night was spent at 10,000 feet at the Horseshoe Meadows Campsite (after the worst dinner Emily and I have ever had at the Totem Cafe). After a leisurely 5-mile hike the next morning, we headed down to get our permits for the route. We then headed to Whitney Portal. We "slept" in the parking lot overnight. Neither of us slept very well at all between the random celebratory yelps of people completing their hikes, the shouting and excitement of people beginning their 2AM day hikes to the top, and of course the bears. There were so many bears in the parking lot. Every 20 minutes was marked by someone screaming "HEY BEAR" followed by hitting something on the ground or loudly whistling. We later discovered one of the trash bins had been way over-filed, which is what was attracting all the critters to the parking lot. Regardless of our sleepless night, we prepared our things and we were off at the crack of dawn. The first part of the hike was pretty straight forward. The slight incline was an easy transition into hiking for the day. My pack was about 35 lbs and Emily's was about 25, so we did pretty good (considering all the camera gear I brought). After about a half mile, we hit the North Fork of the Lone Pine Creek trail. This is where our adventure truly began. Switchbacks follow the North Fork straight up towards Whitney. Accompanying you on both sides of the creek are huge granite walls. The danger of falling rocks was very apparent (a small one hit me in the chest. It smacked me so hard, I thought it was a small bird flying into me). We did not have helmets which was a very bad idea, ESPECIALLY once we got further along in our journey. After crossing Lone Pine Creek three times and winding up the trail a bit, we reached the Ebersbacher Ledges. Every trip report I had read stressed the importance of not getting lost on these ledges, as you could end up very exposed and it's very easy to slip and die. I took screenshots of a video I'd found on youtube so that I could use the rocks and trees as landmarks to find our way up. This was surprisingly one of the easier sections of the trail and we got up past the exposed sections in a matter of minutes. We trudged up more switchbacks, recently claimed by thousands of red ants (luckily no bites) and reached Lower Boy Scout Lake by 11:00 AM. We had a bite to eat and filled our water bottles. From here, we had a decision to make. We could either go right, up a few hundred feet of boulders, out across some slanted, exposed granite and then down to Upper Boy Scout Lake, or we could go left, which was the main route that was longer and crossed a boulder field, some slippery exposed granite, and wound through some shrubbery and flowing water. I had read in a trip report that the way to the right was shorter and less work as long as we were ok with exposed, slanted granite. We chose to go right, which was, in short, the wrong choice. 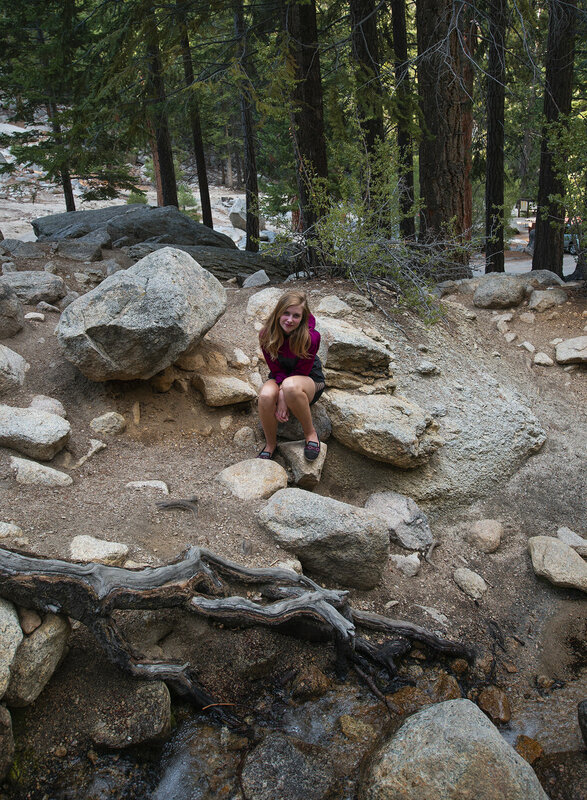 As we approached the granite, Emily made a comment about how steep the granite looked. I told her to stay put, dropped my bag, and ran up the small chute to see if I could easily maneuver across the slabs to the top. The approach was easy enough, but once I reached the slabs, I realized that they did not look any less steep. With full packs and no ropes, I decided I wasn't comfortable taking us across the steep slabs. One slip and we were toast, and I wanted to play it safe. Unfortunately, that meant adding an hour or so of backtracking to our day. We made it back down to the lake and took a rest before heading up the left trail. Following the cairns was the only advice I had seen mentioned in regards to this section of the trail. The other advice I would now add to that suggestion would be to also follow the creek. Instead of just cutting through a section of the brush and over the creek, we followed some cairns up the boulder field, which I can only assume were placed as markers leading to Thor Peak. Halfway up the boulder field, we realized our mistake and, once again, had to backtrack down to the creek crossing. Once we found our way to the right cairns, it was a straight shot to Upper Boy Scout Lake. We first attempted to go right, then we went too far left, then we finally got it right. Looking at it afterward, it seems so straightforward. Hindsight's 20/20 I guess. Within 100 yards of Upper Boy Scott, it began to hail. And I mean HAIL. Some were the size of peanut M&Ms. The inclement weather wasn't unexpected. Every day, between 2PM and 5PM, a storm would roll in over the mountains and bring hail, lightning, and thunder with it. Today, however, the storm came a little late, which we were thankful for. It's no fun navigating boulder fields when you're not sure where you're going, and it's way worse when everything is wet. It was 5:30PM and we had another decision to make. We could either push on through the hail for another 2 hours to Iceberg Lake (where we would camp for the night and summit Whitney in the morning), or we could stay at Upper Boy Scout Lake for the night and tack the 2 hours onto our morning ascent. I saw a guide preparing some food with his group, so I ran over to ask his advice, as I wasn't sure how long the Iceberg Lake hike would realistically take. The guide (part of the Sierra Mountain Guides) was a huge help. Emily and I decided that we would camp at Upper Boy Scout and leave around the same time the guide was leaving in the morning (around 4AM). This would position us into a great timeframe to summit Whitney and return to camp before the daily storm rolled in. We set up camp and ate a well deserved dinner. The storm cleared, but lingered just long enough to set a beautiful stage for sunset. Emily and I being exhausted in our tent. Waking up at 3AM was easier than I thought. We prepared our daypacks the night before, so all we had to do was get our water bottles filled up, and eat some breakfast before we were ready to set off. We saw the guided groups heading off, so we decided to just tag along (from a distance of course). Emily and I had to backtrack a few too many times already, so we seized the opportunity to be lead in the indisputably "right" direction. The view from our tent at 3AM. The moon was casting beautiful light rays that pierced through the rocky peaks. Coming around the corner along Pinnacle Ridge, our first clear look at Mount Whitney and it's surrounding peaks. This is also a great stalker photo featuring a Sierra Mountain Guide and Victor (the gentleman being guided). The trail was pretty straightforward and cairns led us up and over moraines and boulder fields. The early morning walk seemed to fly by, probably because there wasn't much to look at and we were both half asleep still. Approaching Mount Whitney went from really cool to jaw-dropping. BOOM! The light was a red/orange because of some smoke on the horizon. 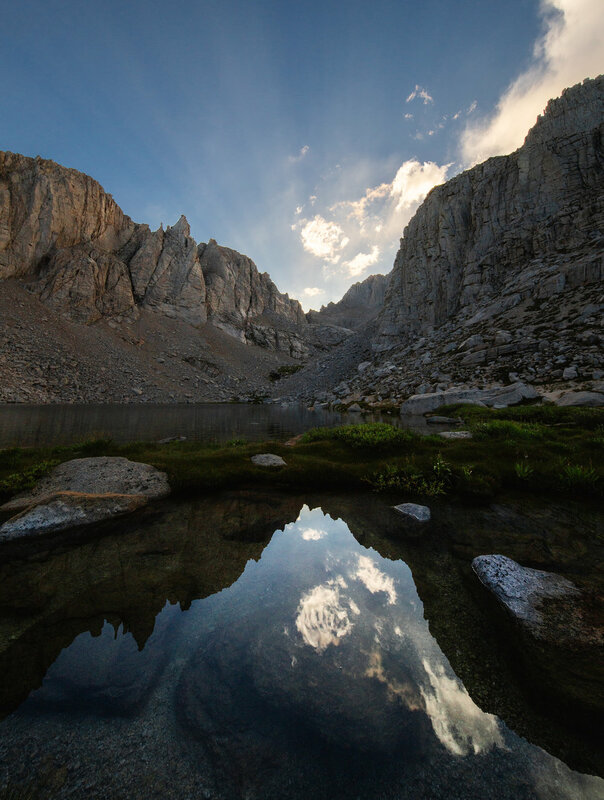 We arrived at Iceberg Lake right as the sun drenched the cliffs of Mount Whitney. It was truly magical sight. After a short break, I grabbed my camera and got some reflection photos at 12K feet. Iceberg Lake at 12,000 feet. I scrambled to every corner of the lake taking photos and finally returned to Emily to refill water bottles and prepare for the hardest part of our journey, the chute. All the online resources that I had read described the chute as a nightmare filled with constantly moving talus and boulders. Which was 100% correct. However, those same resources also said to begin at the bottom of the chute and just trudge straight up. This would have been helpful information in the spring or fall when snow occupied the chute and crampons were used to go straight up, but it was late summer. We opted to do some class 2/3 climbing up to the left of the chute as if we were heading to the East Buttress, and then cut across as to avoid as much loose rock as possible. This was also the path being taken by a few guides, so we felt confident. After an exhausting haul, we made it across the boulder fields and began making our way up the chute. Huge boulders would slide under our feet and we also had to be extremely careful of rocks knocked loose by groups who were ahead of us (this is when helmets would have really come in handy). It was a long, tedious process. The altitude made breaths harder to catch and steps harder to take. Even though we prepared for the height, we still struggled with slight dizziness and exhaustion. Emily jokes in the above video about me buying her a car because she was running out of reasons to keep hiking. *EMILY EDIT: Emily is dead serious about Michael buying her a car, because he owes her one after this “hike”. Pictures really do not do this section any justice. The chute was just this mind-numbingly long fever dream of taking careful step after step. There’s no advice I can offer in terms of a route because the “path” is ever-changing. Make sure to wear a helmet and take as much time as you need. Don’t rush. Mistakes can be fatal. The top of the chute was a bittersweet feeling. Yes, we had conquered the never-ending rock slide. However, we still had another 300 feet to the top, which was riddled with exposed class 3 climbing. We watched as guides and their clients used their ropes to make their way up to the top. I had heard of another class 2 route where people hike straight back and then around to the top, but there was ice and snow dotting the rocks along this path, which made it seem much more dangerous than the latter. We were also running out of energy and daylight for our return trip. I told Emily I wouldn’t be mad if we turned around and called it good. We had given our all and this last bit would be dangerous without ropes. She told me to make a decision. As I weighed the dangers of summiting versus the safety and sanity of my fiancee, she grabbed my hand and said “let’s just do this”. We began climbing. We’d gone from flat ground, to switchbacks, to 45 degree boulder hopping, to 90 degree rock climbing in 8 hours, and we weren’t gonna rest until we stood on the summit. There’s not much advice I can give for this part other than stay left starting out, and then 1/3 of the way up, cut to the right and follow the nose all the way up. Halfway up the last section. It was scary (and Emily’s first time doing this kind of climbing), but…WE MADE IT! The smoke from the seasonal fires obstructed our view to the bottom, but nothing could obstruct our feeling of accomplishment (cheesy). The triumph faded as we realized what came next. The hike down. Hiking down the chute was ten times worse than coming up. Not only was it harder, but it took way longer. I thought going down was supposed to be easy. Our legs were so done. But after numerous breaks and pep-talks, we convinced our legs to keep going and eventually made it back to Iceberg Lake, and then back to our camp. The last picture I took of Mount Whitney. I had dreams of crawling down the chute all night that night. My mind was so focused on each and every step, that’s all I could think about. That and a nice warm shower. We woke up, grudgingly used our WAG bags (we went bambam in our poo bags and had to carry it out), and set off for the trailhead. The only other sketchy part coming down was the Ebersbacher Ledges. Remember those? They were a bit scarier when you have to climb towards the edge of the cliff instead of up and away from it. Luckily a friendly guide (the guardian angels on our trip) let Emily use one of her ropes to hold onto on the scariest part. The rest is history. We got to the trailhead, took off our shoes and ate the best burger of our lives (truly). If you enjoyed this write up and my photos, please consider grabbing a print in my store! I just updated it with photos from the trip. Not many high-quality photographs exist of this route which makes the photos I took extra special! Thanks for reading and be safe out there! Also, feel free to contact me with questions about the route. A scarcely updated, themeless sludge-ball of trip reports, drawings, ideas and whatevers.